Nothing beats my old Frying Pan that’s what I thought I came face to face with Copper Chef Pan. It was Sunday morning when my sister asked me to join her in the kitchen to make some breakfast for my nieces. And right there she handed me this fresh from the box non-stick frying pan. It was her first square-shaped Copper Chef Pan and it was lovely.I saw how good it was in frying eggs, hot dogs, and bacon without any having trouble of sticking up on the pan. And what makes it more amazing, she only wiped it with a clean cloth and it was done. Unbelievable right? So what makes this cooking ware great? Let me Introduce to you its unique qualities including our top 5 of the list Best Copper Chef Pan. What is a Copper Chef Pan? I think this is the best of all copper chef designed specifically for dishes meant for the whole family. It is a family size pan that can perform a lot of things you don’t usually do in a pan. This can function as Rice Cooker, Frying pan, Baking Dish, Wok, Roasting pan and Stock pot. Great isn’t it?What makes it more exciting is the Induction Cooktop available in this set. I have 5 presets and digital display for more accurate cooking. The pan is nonstick, copper infused and highly resistant to heat. Having this one in your kitchen will definitely ease your cooking. Pieces in a Set: 7 pcs. 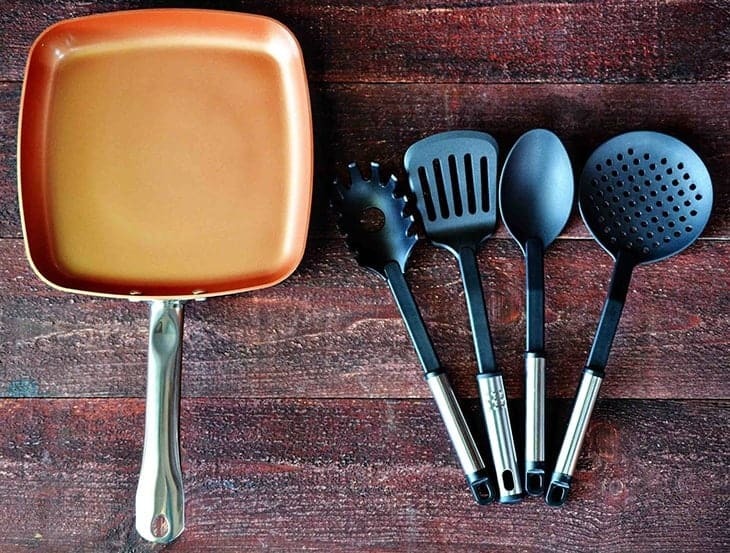 This is an amazing set of Copper Chef items. With all these items you will be having no trouble in cooking at all. You can steam and fry dishes using the same cookware in a flash. These items have a 100% cerami-tech Outer coating with a stainless steel Induction plate at the bottom for a much better heat distribution. The interior is also bonded with ceramic pieces to create a non-stick capability. It contains no PTFE and PFOA so it’s safe to use.The round and square design is an advantage when cooking requires too much room for the food ingredients. Surely mothers out there will love this cooking set for special occasions and events. Pieces in a Set: 3 pcs. 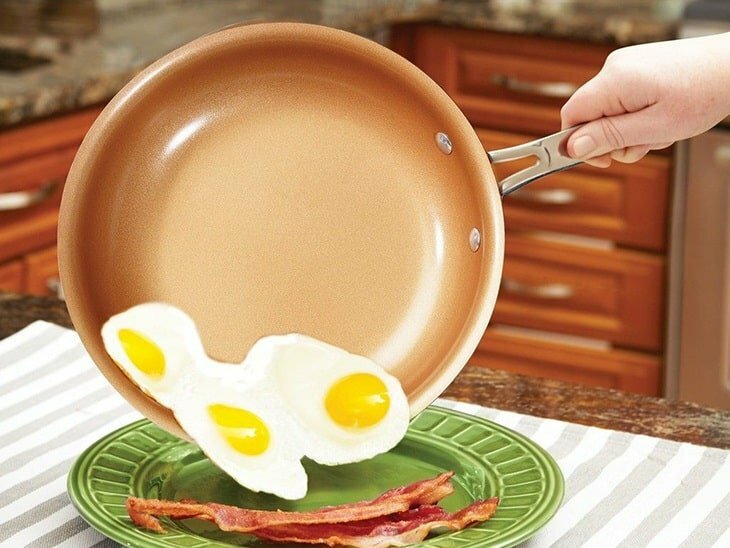 Now this will make a good collection of fry pan in your kitchen. Imagine the 3 sizes you can choose from for an ideal frying experience. This will be great for frying fish with undetermined size. This is Induction ready and it's non-stick property makes it more ideal for frying activities. The handles are attached to the body through rivets thus making it more secure from lifting and flipping. These amazing square shaped deep dish casserole pan comes in two incredible sizes; 8 inches and 11 inches. They can be used in the oven as well as to induction stoves. It has a built in stainless steel induction plate for a better heat dissemination throughout the whole body for efficient cooking. It can withstand heat up to 850°F and free from PTFE and PFOA. The design was wonderfully made giving more room for ingredients when cooking. The lid was made from tempered glass. If you want one copper chef pan yourself and your mother also need one this is the answer. It is like hitting two birds with one stone. This set comes in 2 pcs of round fry pan both with 10 inches size. 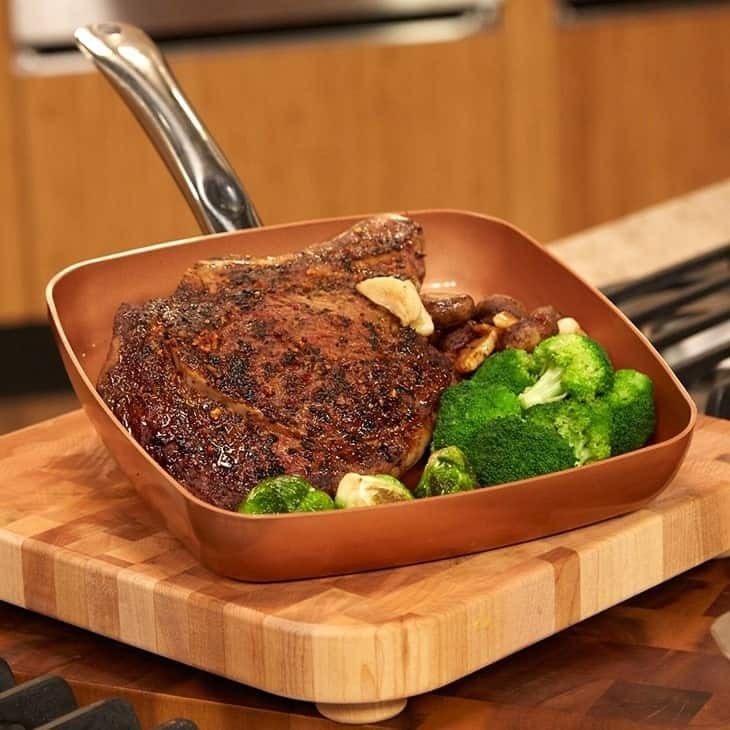 This is copper infused fry pan with ceramic bonding is non-stick and can resist heat up to 850°F. These are Induction ready and Dishwasher safe. 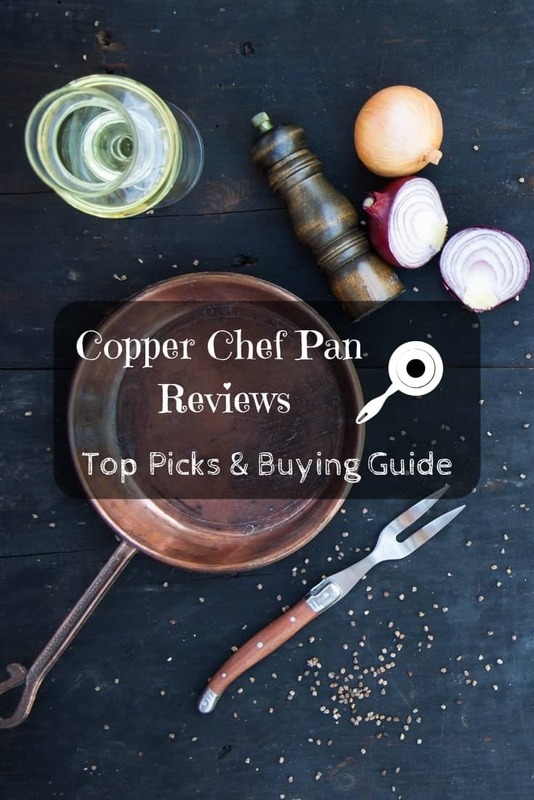 Copper chef #pan reviews – top picks & buying #guide. Copper Chef Pan is not just any non-stick pan, it undergoes engineering using cerami-tech that makes it exceptional for cooking. This pan is highly durable and capable to handle heat as high as 850°F. Most of non-stick pans are not induction ready but this one does for it was built with a stainless steel induction plate at the bottom. And the best part, it is infused with copper making it more reliable for an even distribution of heat during cooking.This is the best alternative you can find for that expensive copperware you have been dreaming of. It can provide you the same quality results what pure copper gives like heat conductivity, quick dispense of heat and precise heat. Same qualities that are essential to creating dishes where texture, consistency, and flavor are at stake.Copper Chef Pan is also not toxic in design. You cannot found harmful chemicals in this like PTFE (Polytetrafluoroethylene) and P﻿﻿﻿﻿F﻿﻿﻿O﻿﻿﻿﻿A ﻿(Per﻿﻿fl﻿﻿﻿u﻿orooctanoic﻿﻿﻿ aci﻿﻿d﻿﻿) that are used in making non-stick pans. These synthetics are lethal and are usually emitted when exposed to heat for about 500°F. These pans are totally safe and guaranteed to last for a long time using in the kitchen. Copper Chef pans are beautifully designed and its beauty will surely add more glamour to your kitchen. But the question is, does it suits your cooking needs and style? 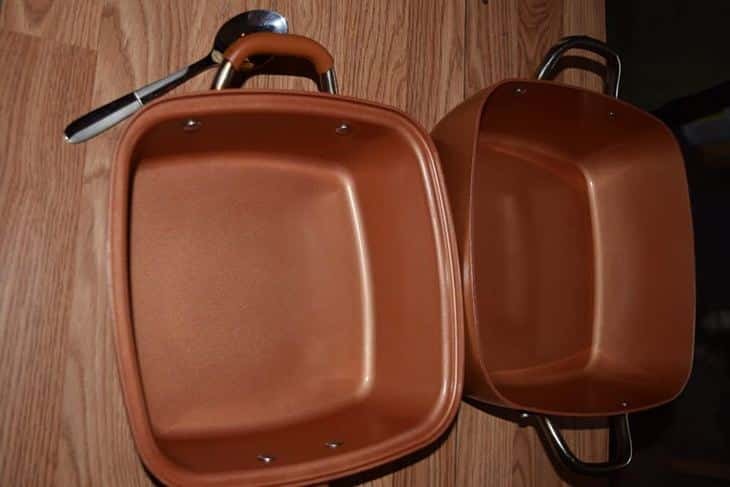 To make it easier for you to decide, I will give you the advantages and disadvantages of Copper Chef Pans. Since it is copper infused, it has the unique characteristic to conduct heat evenly throughout the whole pan. Because of this, food is being cooked evenly even if it the frying pan is congested with too much food ingredient inside. Unlike any other Pan, you can be assured that there is no hotspot for this one. This is the selling point of this product. It uses ceramic bonding technology to make your cooking easy and perfect. Copper can dispense heat very quickly so overdone food are being avoided most of the time. Why settle for expensive copperware when you can have same best result using copper infused pan. 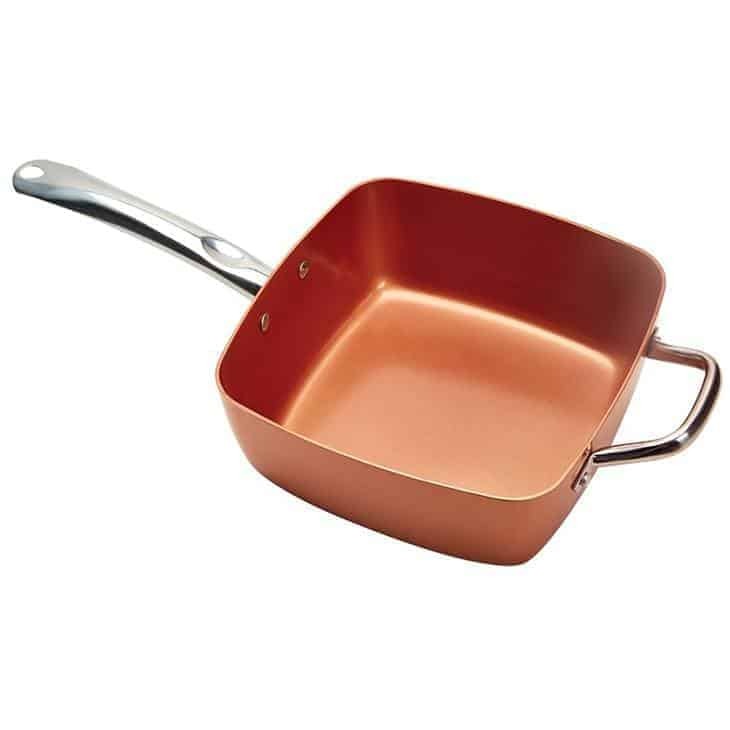 Copper Chef Pan was designed for easy maneuverability and handling during cooking. It doesn’t contain chemicals like PTFE and PFOA so it is safe to use. Cleaning will not be a problem since it is a not stick. Just use a soft sponge when washing it. These are top of the line when it comes to style and finishes. The interior and handles are well crafted from high-grade materials. 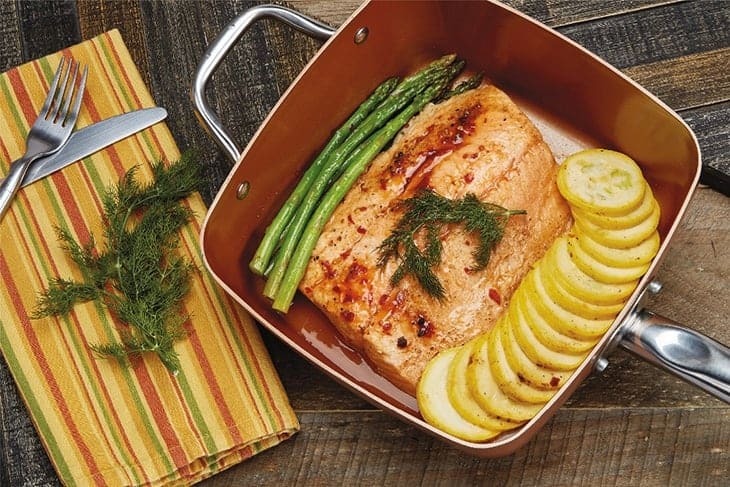 Copper Chef Pans can resist heat up to 850°F and can be used in the oven for varieties of dishes. The handles are made from stainless ﻿﻿steel and may heat up while cooking. This often results from overuse and age. Poor maintenance and inappropriate cleaning can lead to the thinning of your pan. 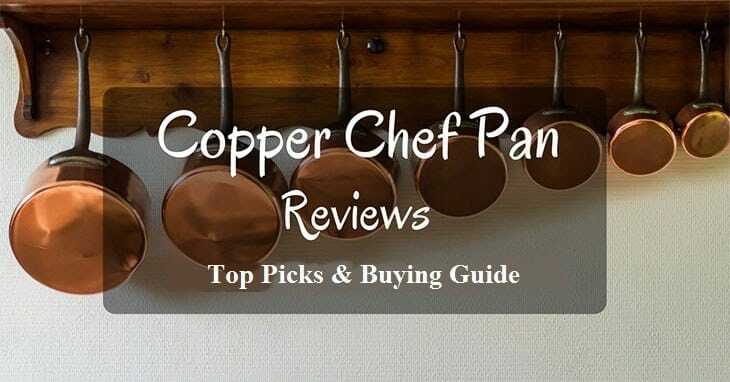 When choosing your Best Copper Chef Pan several considerations should be made first. They are essential qualities of a pan that match your cooking needs. Though most of them are all looks the same still they differ in some aspect that we need to be aware of. Let check it one by one. Make sure to make an Inquiry on how thick your pan is including its weight. A 2.0 mm thickness will be suitable, but lesser than this is will not last long as you want it to be. Never assume that all featured in advertisements are true rather go out there and check it for yourself before buying. Trust only those pan that is made from credible manufacturers that have ISO certificates. This means that these people are following Quality and Safety standards for their product. This will assure us that what they are selling is safe and healthy to use based on the requirements imposed on them by law. A lot of people goes for this because they are cheap or inexpensive. Or maybe they are unaware what look for in an original product. Try to be more cautious about this because there is a lot them circling in the market. Never fall to cheap price tags when choosing your pan. Most of the time quality is being sacrificed in terms of the material used, efficiency and durability. Usually, they make their products more appealing and cheaper just to lure consumer of buying them. Your best Copper Chef Pan must possess these properties; Great Heat Conductibility and Durability. Check for the handles, lid, interior and exterior of your Copper Chef Pan to see how good they were made. The handles, for example, are being fixed through rivets, solder or bolts, make sure that they are not poorly attached to the pan. Never use a metal cooking utensil on your Copper Chef Pan to avoid any damage to it non-stick properties. Do not use steel wool when washing rather uses a soft sponge to do the cleaning. When the pan is still in extreme heat do not wash it directly with water. As much as possible start your cooking on a low medium heat setting. You may season your Copper Chef Pan to prolong its non-stick life. These two copper infused products are highly debated to which one is the best non-stick pan in the market. For the sake of argument let me show you the similarities and difference of both. Copper Chef Pans are one of the best when it comes to copper infused cookware. When it comes to quality, design, and craftsmanship nothing beats this one. Having this one in your kitchen will surely make cooking easy and exciting. Of all the list we have, I prefer to choose Coppe﻿﻿r Che﻿﻿f﻿﻿ ﻿﻿XL 11" Casserole 5 pc﻿﻿ Set & Induction Cooktop due to its versatility. I love the Induction Stove included in this set together with the multi functioning casserole pan.